Here is Nyarlathotep, the creeping chaos always smiling beside you. 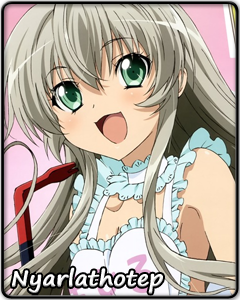 But you can call her Nyaruko for short. Like any self-respecting cosmic horror, if Nyaruko has any reason to visit Earth, it is the planet's universe-famous entertainment industry. A bodyguard assignment there is a great opportunity to smuggle this and that off the planet, too. But unlike most cosmic horrors, Nyaruko has yet another objective behind her trip – the pursuit of love! Nyaruko is used to doing things at her own pace, even if those around her cannot exactly keep up. Her whimsical nature makes it impossible to predict what wicked idea she will come up with at any time. Which is why even a short conversation with her might result in a significant loss of sanity points. Approach at your own risk! But just because some of her motives might be unfathomable to mere mortal beings, it does not mean Nyaruko is alien to human feelings like the desire for acceptance and affection. And once in a while, the cheery extraterrestrial shows a more serious side. If there is something she holds dear, Nyaruko will use all of her horrifying powers to protect it.